What could be more simple and comforting than Chicken Noodle Soup? Nostalgic for some chicken and noodles, I started a simple stock and added rich, aromatic undertones with crushed saffron threads. 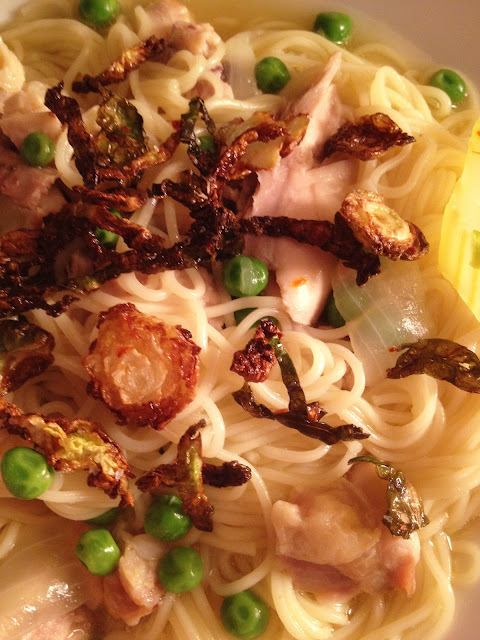 The soothing, flavorful broth was set off by a tangy, crunchy topping of fried Brussels sprouts. Season the chicken thighs with salt. Let rest at room temperature for 30 minutes. Meanwhile, bring the water or stock to a boil over high heat. Add the onion, garlic, bay leaf, thyme, saffron, peppers and soy sauce. Add the chicken and celery, and return to a boil. Reduce the heat, and simmer for 45 minutes, skimming the fat into a deep cup. Remove the chicken to a dish; skin and debone chicken. Tear or cut the chicken into pieces. Check the cooking liquid for seasoning, adding more salt and pepper to taste. Cook the pasta according to the package directions in the cooking liquid, adding the peas during last minute of cooking time. Add the chicken. Ladle the soup into serving bowls (use tongs to serve the noodles). Sprinkle with the fried Brussels sprouts and serve at once. Dry the sliced Brussels sprouts thoroughly. Heat oil and fat over medium-high heat. Carefully add the Brussels sprouts and fry until crisp. Remove to paper towels and drain. Season to taste with salt and Aleppo pepper, adding a pinch of brown sugar. Toss to coat. Sprinkle over the soup and serve at once.